Join Tammy's exclusive reader group where you'll get updates, deals, chances to enter giveaways, and the latest news about her books about once a month. Provide your email address to join and you'll get the fun interview she did with the dogs from her books as a special thank-you gift FREE! 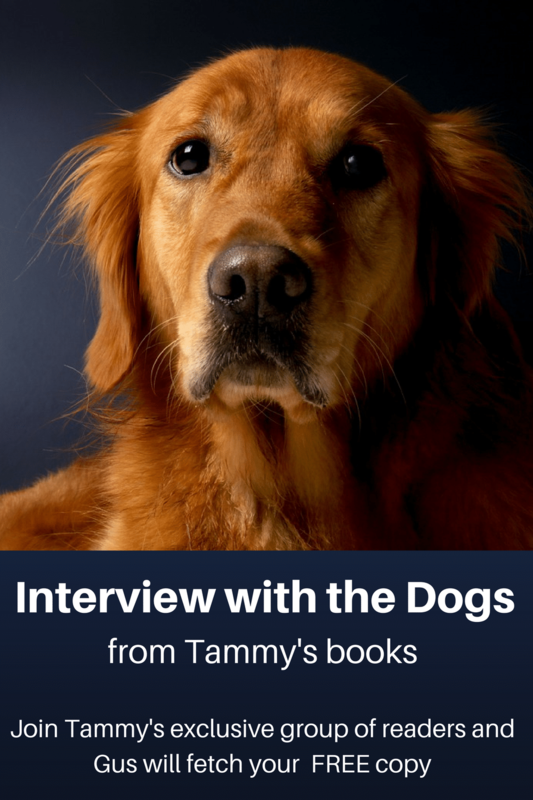 Get a Fun Interview with the Dogs in Tammy's Books FREE! Learn MoreGet your FREE & FUN Interview! Mary smiled. “I would enjoy spending time with you. It would give me something to look forward to each week.” She spent the rest of the afternoon quizzing him about his family. She wanted to know about her grandparents and other relatives. He suggested they sit on the porch, where he took a leather pouch from his inside jacket pocket. He retrieved a pipe and a tin of tobacco. She watched as he took pinches from the tin and with practiced fingers, tamped it into the shiny wooden bowl of the pipe. He struck a match and circled it over the bowl while taking long draws from the stem. He extinguished the match and puffed on the mouthpiece while rings of smoke danced above him. She felt his strong grip and longed for him to stay. The scent of his pipe mingled with the citrus from the fresh lemonade. “I’m the happy one,” she whispered, her eyes squeezed tight. “Yes, yes. I’ll meet you at the movies.” She walked with him to the sidewalk, arm in arm, and waved goodbye until she could no longer see his Cadillac. She trotted back into the house and went about her packing duties. PreviousMaple Street Memories #8NextSave the Date! Get Conversations with Dogs FREE! If you love dogs, you'll love this!